This auction will be loaded with High Grade 1962 – 1968 Marvels including #1s and Key Issues, as well as rare comics from the Golden Age and Bronze Age. Sparkle City Comics will also be offering some recently unearthed Original Comic Art gems. Superman #1 is one of the most costly and sought after comic books. The character Superman began as one of several anthology features in the National Periodical Publications comic book Action Comics #1 in June 1938. The strip proved so popular that National launched Superman into his own self-titled comic book, the first for any superhero, premiering with cover date Summer 1939. Detective Comics #38 features the origin and first appearance of Batman’s trusty sidekick, Robin. This comic dates back to 1940, from the Golden Age of comics when Superheroes reigned supreme and the lines between good and evil were clear. With the stunning success of Superman, DC really got behind it’s Superhero creations. Original and authentic copies of early Detective Comics are among the most sought after and valuable books from this time period. Robin is every bit as much a part of the success of the Batman Franchise as Batman himself. Amazing Spiderman #1 is the first issue of Spiderman’s self-titled comic. Appearing first in Amazing Fantasy #15, Spiderman took off in popularity, and shortly after, a designated Spider-Man title was launched in 1963. There is probably no Superhero currently as well known or collected as Spider-Man. Sparkle City Comics is always buying comic book collections and is still accepting qualified consignments for this special auction. 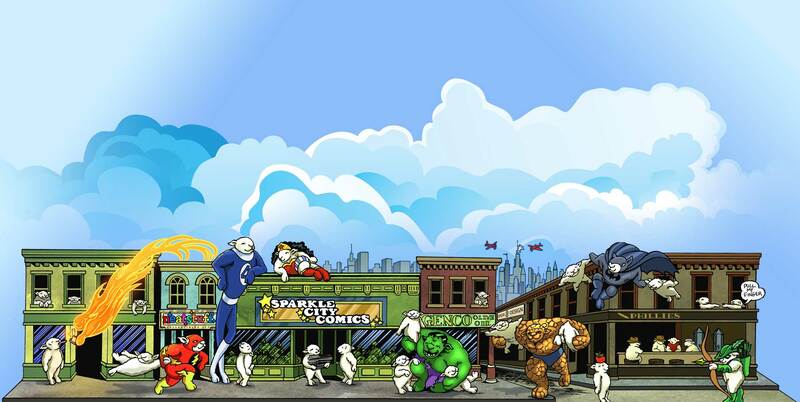 If you have any individual comics or an entire comic book collection you’re interested in selling, give Sparkle City Comics a call today.